I never really discuss much on my blog about my day job. Being an art-school graduate in today's economy is a struggle, to say the least. In these difficult financial times it isn't easy to find employment of any kind for recent grads, and it breaks my heart to bear witness to a society that places so little value on the arts. Only a select few of my peers have moved on to make a living from their art in some form or another. Many days I feel incredibly sad when I reflect on the untainted idealism of our spirits as eager freshmen; the way we were bursting with creative energy and hunger to express ourselves. On those days I find it hard to concentrate on what pays the bills. That being said, when it comes down to it, I am incredibly fortunate to work where I do. I may not be doing what I used to picture in my head, but sometimes the picture in your head has to shift and change in order to get you wherever you're meant to end up. The museum world, though often tedious, is teaching me a tremendous amount. Since beginning my job a little over a year ago, I have become a better problem solver, a better communicator, a better writer. Most importantly, I have learned a lot about myself. I battle with anxiety, deadlines, the weight of small details, and a constant yearning to seek my truest calling (whatever that may be). In the meantime, I look for a little good in each day. Sometimes at my job I get to work with really amazing artists and makers. In September I enlisted husband and wife duo Morgan and Crissy-Liu Packard, who promote a project called Lattice Work. 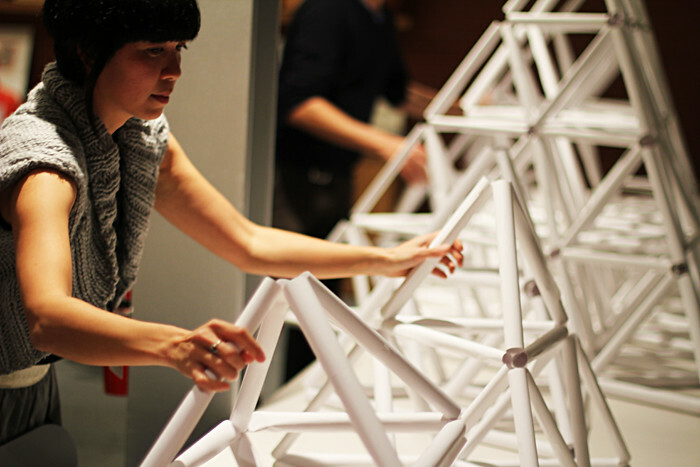 Lattice Work, a tetrahedron-based collaboration, promotes community engagement across various disciplines. Crissy and Morgan came to the Studio one evening and upwards of 200 people participated over the course of a few hours. What I loved most about this project (aside from the awe-inspiring visual end result) was that people approached it from so many different angles. Some came from mathematical backgrounds, some from engineering, some from architectural perspectives, and of course many from artistic/creative fields. It was amazing to hear all of these people interact and learn things from each other while the structures were being built. Check out this super fun video of Crissy destroying one of their structures in Brooklyn, New York. In October I worked with the Papercut Zine Library to draw parallels between the Museum archives and modern day zines. Guests were then invited to contribute pages to a collaborative zine. I am still working on getting the final pages all together into one bound piece. The original will stay with the Studio, and a copy will go to the Papercut Zine Library. 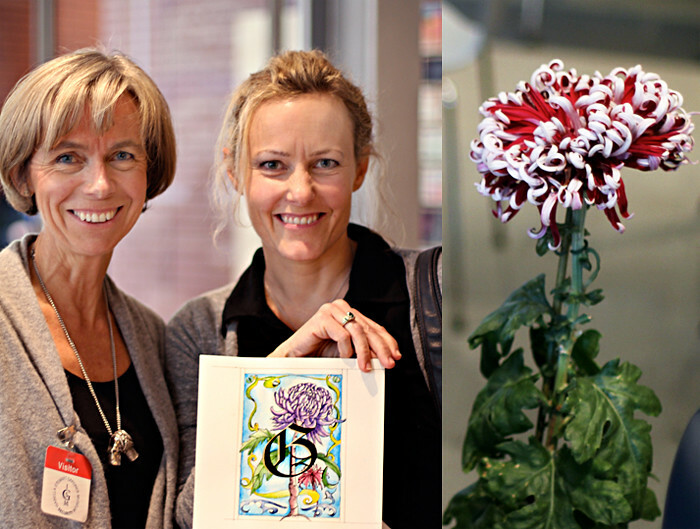 The first weekend of November, internationally exhibited botanical illustrator Sarah Roche came to the Studio to introduce Museum guests to her art form. Working with watercolors and an incredible variety of chrysanthemums (thanks to the Museum's greenhouse! 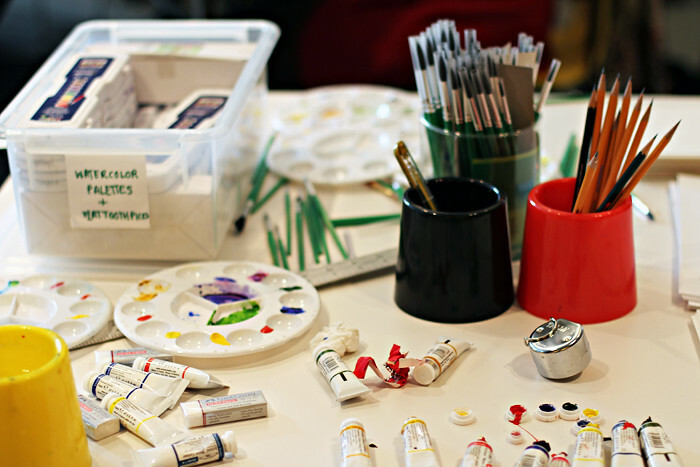 ), visitors sketched and painted all day long. Taking inspiration from the collection, everyone received gothic style lettering on heavy card stock to illuminate with colorful mums. I saw more adult participation in the Studio than I had in a very long time that day- in fact it was mostly grownups joining in! All ingredients came together successfully- Sarah's warmth and inviting personality, the allure of the exotic chrysanthemums, and a little help from a mention in the Boston Pheonix. It was a truly special day.